M uslim Citizens in the West: Spaces and Agents of Inclusion and Exclusion, by Samina Yasmeen and Nina Markovic. Ashgate. 2014. This is a collection of papers concerning the experiences of Muslims living as minorities in the West, united by a common theme of exploring factors which promote their inclusion in or exclusion from the majority society. The editors both hold positions in Australian universities, and the original inspiration for this collection was a research project on the experiences of Muslims in Australia. Five out of the fifteen papers concern Australia; the remaining contributions cover Europe, Canada and Asia. Although the contributions were apparently invited for the purpose of providing comparative international material, there is almost an air of randomness about the countries covered and readers are left to do most of the work of extracting the interesting comparative points themselves. Perhaps the book would have benefited from a final editorial chapter explicitly drawing out these points. Two of the papers concern Singapore and India respectively. These are particularly interesting because they deal with Muslims living as minority communities in nations where the majority communities are not European. 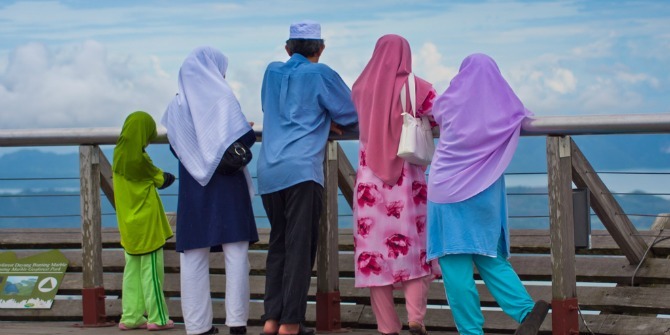 One might raise an eyebrow over their inclusion in a collection about Muslims in ‘the West’, but the editors explain that they are there for the purpose of providing an Asian comparison with the West. This, however, raises an important theoretical point. The historical circumstances which produced Muslim minorities in these two Asian countries are entirely dissimilar from those which produced the minority Muslim communities of Europe, North America and Australia. The only thing that Muslims in Singapore have in common with those of, say, France, is their religion. Is it legitimate to regard the mere fact of being Muslim as justifying such a comparison of social circumstances? Does this not risk tacitly encouraging the view that there is a global “Muslim problem”? That this view is already prevalent is demonstrated by the reporting of Asian stereotypes of Muslims that seem remarkably similar to those circulating in the West. In all of the countries studied here Muslims are perceived as wishing to isolate themselves, lacking interest in education, achieving less economically and of course as being sympathetic to terrorism. It would have been interesting to see a more explicit discussion of whether the globalisation of media outlets has led to such stereotypes circulating internationally, irrespective of the histories of particular societies. As it is, none of the contributions in this collection clearly separate the global from the local. An additional weakness is that the book seems to have had no language editing, leaving some potentially valuable material and arguments difficult to follow in detail because of unsatisfactorily expressed English. This collection does, however, move on the debate on social inclusion in some welcome ways. Several contributors acknowledge that some Muslims do choose to self-isolate in some circumstances. For example, Samina Yasmeen relates how an Eid celebration in a public park in Perth created some public order problems, and Muslims who co-operated with the authorities to resolve them were treated as having betrayed their community by some other local Muslims. Zijad Delic produces a powerful argument in favour of ‘constructive integration’ by Canadian Muslims, recognising that some Muslims in the West talk as if the views of non-Muslims were of little importance and condemning such an attitude of superiority as un-Islamic. Ziad Delic draws heavily on the work of Tariq Ramadan to support his argument that the essential principles of Islam – as opposed to inherited cultural traditions – can be observed easily in the liberal democratic society of Canada. Adriaan Wolvaardt contributes an interesting study of conflict between two minority groups, Armenian-Australians and Turkish-Australians, over the erection of a memorial to the Armenian ‘genocide’ of 1915. It provides a salutary case study of identity politics in action and a warning of how well-intentioned support for one minority group by the civic authorities may inadvertently upset another. In this it forms a valuable corrective to the more naive version of ‘state sponsored multiculturalism’. The most enjoyable section of the book is entitled ‘The neglected spaces: art and literature’. The two chapters in this section deal respectively with literature in France, and visual arts in Australia. Fiction and the arts are rarely considered in discussions of social inclusion and this section comes as a welcome change from interview based studies. Hélène Jaccomard’s study of novels by Muslim authors in French provides a useful introduction to the history of French colonisation in North Africa and its painful legacy in the contemporary cities of France, where the official rhetoric of equal citizenship continues to struggle with the survival of attitudes born from the roles of coloniser and colonised. The nuances of such attitudes can often be illustrated better in fiction than in academic writing. France’s withdrawal from Algeria was a particularly reluctant and violent example of decolonisation, and this explains much of the continuing bitterness of Muslim-state relations in France. Hamida Novakovich’s account of several exhibitions of art by Australian Muslim artists includes a number of attractive photographs of art works and makes some suggestive points about the value of the arts as a ‘space of inclusion’ for minorities. The discussion of ‘Faith, fashion, fusion’, an exhibition that showcased the incorporation of hijab-wearing Muslim women into the fashion industry, raises important questions about the commercial factors driving the inclusion and adaptation of cultural traditions in modern society. Such questions could perhaps be usefully addressed by some other authors; academics have a tendency to overlook the role of business and concentrate over-much on the importance of public funding in promoting the acceptance of minority cultures, as Novakovich herself does in the rest of her paper. This book is a useful addition to the literature on the Muslim communities of the West. Those working in this area whose reading has been largely confined to Europe will particularly welcome the wider perspective it brings to the issues. Elaine Housby has a Masters degree in Politics and Sociology from Birkbeck College, London, a Masters degree in Modern Middle East Studies from St Anthony’s College, Oxford and a PhD from the Open University for a thesis in the field of Religious Studies. She is the author of Islamic Financial Services in the UK and Islamic and Ethical Finance in the UK, both published by Edinburgh University Press.